Not long ago I reviewed the Deadbolt’s Derelict set by Deathray Designs, exploring the concept of building a massive Zone Mortalis-style board out of MDF for a price…slightly less ruinous than trying to do the same from Forge World. One of the comments I had was that the main set is missing doors, and this was, in my mind, a pretty major gap. The Deathray Designs people got in touch with me and let me know that this was a gap they knew about as well – and they had a set in production. They were kind enough to send me one to review – so lets see how it stacks up head to head with my suggested alternative, the new plastic doors from Necromunda. First, an acknowledgement: Deathray did send me this set for free, though I’ve ordered several terrain sets from them already, including two of the Deadbolt’s Derelict main sets. I don’t think this had colored by review, but there’s no harm in putting that out there. The kit is planned to include five wide doors, and two narrow ones (essentially, door sets where only one “unit” of the two is a door, and the other is a wall). This design philosophy is very similar to that of the Necromunda doors, which makes sense, as Deadbolt’s Derelict is pretty generally a drop-in set for the boxed Necromunda game. Deathray is looking to release the kit on March 22nd. Pricewise, I’ve been told their aiming for $35. This puts Deathray at a little bit of a disadvantage compared to the GW kit, which includes 14 doors for the same price, four of which are of a design this kit doesn’t have, a genuine “single-space” piece. That’s something of an awkward position for an MDF kit to be in, and so the decision comes down to a question of appearance, design, and compatibility with the rest of the Deadbolt’s Derelict kit. I wanted to make fun of your little doors, but those are actually pretty cool. The kits themselves are pretty clever – once I figured out how to put them together thanks to some in-progress shots from Deathray. Essentially, include an outer wall “frame” just like their main kit, but the interior is hollow, and the top designed to allow a drop in door. Neat, no? One of the nice features of this is that it allows the main doorframe to remain attached in place while the door is opened or closed, destroyed, etc. 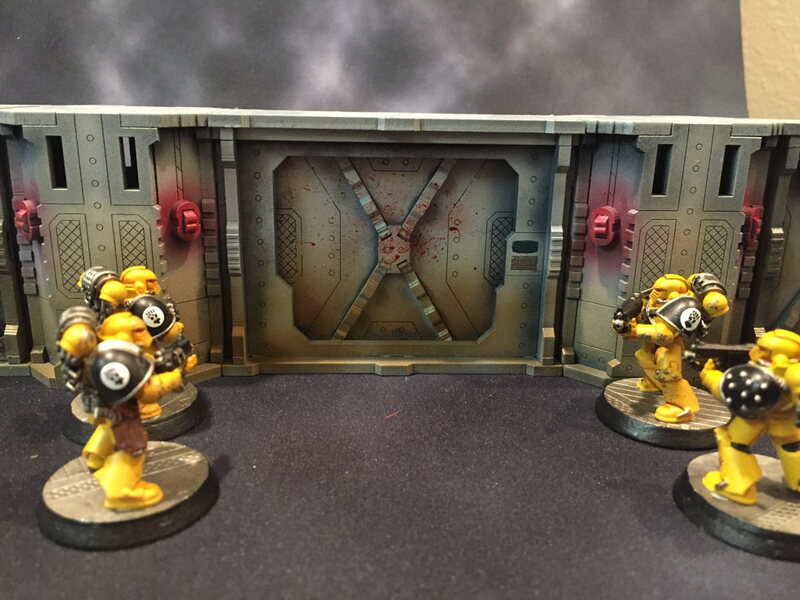 In contrast, the solid-plastic Necromunda doors need to be removed from the table once they are destroyed, and modeling wise are always closed. Design-wise, I painted up two doors, a large one (in the video above) and a small one, in addition to a Necromunda door for a side-by-side comparison. They’re all painted to the same standard – primed black, a highlight step in white, the basecoat in Minitare’s Concrete Slab, followed by shading and some rough weathering, and then one embellishment – the blood spatters, a colored door marking, or a bit of quick-and-easy OSL. 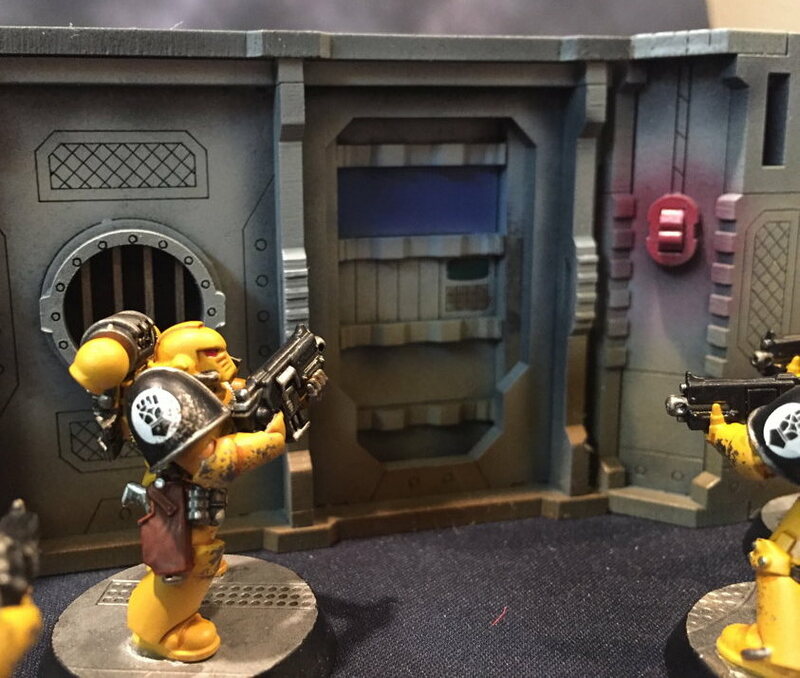 The door from the Necromunda set obviously has the edge on detailing – MDF isn’t going to compete with injection moulded plastic. That being said, I don’t know that I think the set suffers for it – I think with terrain that you often need something of a light touch to avoid overwhelming the actual figures. The Necromunda door has all manner of pipes and wire and dials, etc. that you could certainly paint if you wanted to, but seems like overkill for the average terrain project. And overall, I think the set would look genuinely good on the tabletop. That it’s also fully compatible with the main set, and exists at the same height is also really nice, though admittedly the Necromunda door isn’t vastly on the wrong scale. Design wise, I also like the depth of the MDF doors, which is a product both of needing that boxy structure for stability, and also the open/close mechanism for the door itself. It feels like a substantial bulkhead. One note while painting them though – remember that the edges of the doors will be primarily hidden. I did some chipping and weathering effects on both door sets, but because I was trying to be subtle with it, it’s only really visible for the brief instant while the door is being removed. Hence the decision to do a front-and-center blood spatter on the larger door. Also, as an aside, durability wise I can attest that they all survive an informal drop test thanks to one of my dogs getting underfoot and me tripping over him. The plastic piece experienced some minor chipping, and one of the MDF frames has a very small and easily covered divot, but otherwise they survived a fall more serious than anything they should experience on the tabletop. 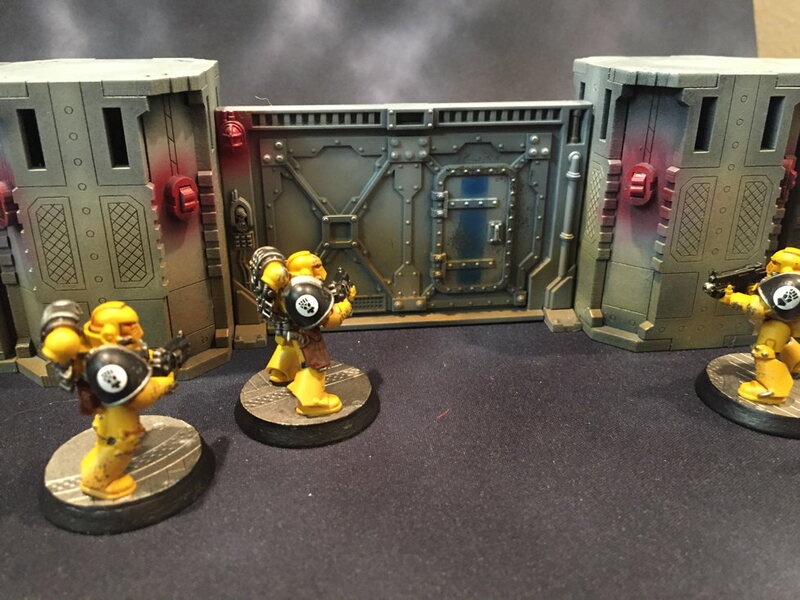 I’m just as pleased with the Deadbolt’s Derelict door kit as I am with the main set, and I think it would be a worthwhile addition for those looking to build their own Zone Mortalis style set. I think you’ll only need one set of doors per main kit, so equipping a modest 3×3 or 4×4 table shouldn’t be too hard. The traditional MDF value proposition isn’t there compared to the Necromunda set, which benefits from GW’s economies of scale, but it isn’t prohibitively more expensive. To my mind, it comes down to a stylistic choice – the movable parts of the Deadbolt’s Derelict kit and the full compatibility with the design philosophy of the rest of the terrain vs. the edge in detail of the plastic doors. In my view, that’s a good choice to have to make. If you are interested, Deadbolt’s Derelict is available here. And they have been kind enough to offer readers of Variance Hammer a special deal. Use the code vhderelict10 for 10% off your order! Nice review! I think I do actually prefer the DD doors in this context ,and the ability to open them like that is really cool. As you say, tho, it’s definitely not a situation where one is an objectively clear choice over the other, which is a good situation all around. Yeah – I think I prefer the DD doors, but having two equally valid affordable options for a distinct niche of a niche hobby is…a good situation to be in, generally. When I set up my Necromunda set I found the tiles are not quite 12 square as I had thought they would be. They”re something like 11 1/2. Have you tried setting up these walls on the Necromunda tiles? How well do they fit? No, I haven’t – I don’t own the Necromunda set, as my interest is primarily in 30K/40K and the local group hasn’t shown much desire to be playing.